This article is about the American footballer. For the Northern Irish football (soccer) player, see Jamal Lewis (footballer). Jamal Lewis (born August 26, 1979) is a former American football running back in the National Football League (NFL). He was drafted by the Baltimore Ravens fifth overall in the 2000 NFL Draft. He played college football at Tennessee. 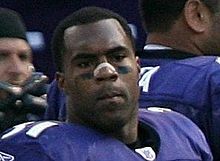 After spending his first seven seasons with the Ravens, Lewis signed a free agent contract with the Cleveland Browns prior to the 2007 season and retired after the 2009 season. A running back (RB) is an American and Canadian football position, a member of the offensive backfield. The primary roles of a running back are to receive handoffs from the quarterback for a rushing play, to catch passes from out of the backfield, and to block. There are usually one or two running backs on the field for a given play, depending on the offensive formation. A running back may be a halfback, a wingback or a fullback. A running back will sometimes be called a "feature back" if he is the team's starting running back. The National Football League (NFL) is a professional American football league consisting of 32 teams, divided equally between the National Football Conference (NFC) and the American Football Conference (AFC). The NFL is one of the four major professional sports leagues in North America, and the highest professional level of American football in the world. The NFL's 17-week regular season runs from early September to late December, with each team playing 16 games and having one bye week. Following the conclusion of the regular season, six teams from each conference advance to the playoffs, a single-elimination tournament culminating in the Super Bowl, which is usually held in the first Sunday in February, and is played between the champions of the NFC and AFC. Lewis is best known for his career as a Raven, where he contributed to the team winning Super Bowl XXXV as a rookie. Lewis is also known for his outstanding 2003 season, where he rushed for 2,066 yards (third-most all-time, behind Eric Dickerson and Adrian Peterson) and was named AP NFL Offensive Player of the Year. That same year, Lewis also rushed for 295 yards in one game, which was the single-game record until Adrian Peterson rushed for 296 yards in 2007 against the San Diego Chargers. Lewis was inducted into the Ravens' Ring of Honor on September 27, 2012. Super Bowl XXXV was an American football game between the American Football Conference (AFC) champion Baltimore Ravens and the National Football Conference (NFC) champion New York Giants to decide the National Football League (NFL) champion for the 2000 season. The Ravens defeated the Giants by the score of 34–7, tied for the seventh largest Super Bowl margin of victory with Super Bowl XXXVII. The game was played on January 28, 2001 at Raymond James Stadium in Tampa, Florida. The 2003 Baltimore Ravens season was the team's eighth season in the NFL. They improved upon their previous output of 7–9, instead winning 10 games and making a playoff appearance. One notable moment from the season came in week 2, when Jamal Lewis rushed 295 yards against the Cleveland Browns, setting the NFL record for most rushing yards in a single game. In week 12 against the Seattle Seahawks, Baltimore fought a 41–24 deficit to win 44–41. The game was named to NFL Top 10 as #9 on Top Ten Comebacks. Eric Demetri Dickerson is a former American football running back who played in the National Football League (NFL) for eleven seasons. Dickerson played college football for the SMU Mustangs of Southern Methodist University and was recognized as an All-American. He was selected in the first round of the 1983 NFL Draft and played professionally for the Los Angeles Rams, Indianapolis Colts, Los Angeles Raiders, and Atlanta Falcons of the NFL. During his NFL career, he rushed for over 13,000 yards. He holds the NFL's single-season rushing record with 2,105 yards, set in 1984. Dickerson was inducted into the Pro Football Hall of Fame in 1999. He wore prescription goggles throughout his career due to myopia. Lewis attended Douglass High School in Atlanta, Georgia, where he was a letterman in football and track. Lewis was rated as the top running back prospect in the nation by Super Prep. Prep Star rated him as the No. 2 southern RB. Lewis rushed for 25 touchdowns as a senior and earned AAAA All-State and All-City honors. He was named MVP of the Georgia-Florida All-Star Game, with 137 yards on 11 carries, for a 12.4 average, and two touchdowns. Lewis gained 1,923 yards and scored 28 touchdowns as a junior and 1,240 yards and 15 touchdowns as a sophomore. In his three years as a starter, he rushed for a school-record 4,879 yards and 68 touchdowns, plus had a 9.7-yard average per carry. [ citation needed ] While at Douglass, Lewis converted from a fullback to the starting running back. As a freshman at Tennessee in 1997, Lewis rushed for 1,364 yards and seven touchdowns. For his efforts, he was named first team Freshman All-America by The Sporting News and second-team All-SEC by the Associated Press. In the 1997 season, quarterback Peyton Manning caught a 10-yard pass from Lewis in against Arkansas. In 1998, Lewis suffered a torn lateral collateral ligament in his right knee and missed the rest of the season. In his three-year career at the University of Tennessee, Lewis rushed for 2,677 yards and accounted for 3,161 all-purpose. Lewis ranks fifth on the university's list of all-time rushers and fourth in all-purpose yards. He was an arts and science major while at the University of Tennessee. The Associated Press (AP) is a U.S.-based not-for-profit news agency headquartered in New York City. Founded in 1846, it operates as a cooperative, unincorporated association. Its members are U.S. newspapers and broadcasters. Its Statement of News Values and Principles spells out its standards and practices. Peyton Williams Manning is a former American football quarterback who played 18 seasons in the National Football League (NFL), primarily with the Indianapolis Colts. Considered to be one of the greatest quarterbacks of all time due to his numerous career achievements, he spent 14 seasons with the Colts and was a member of the Denver Broncos in his last four seasons. Manning played college football for the University of Tennessee, leading the Tennessee Volunteers to the 1997 SEC Championship in his senior season. He is the second son of former NFL quarterback Archie Manning and older brother of New York Giants quarterback Eli Manning. The 1997 Arkansas Razorbacks football team represented the University of Arkansas during the 1997 NCAA Division I-A football season. Regarded as the best available tailback alongside Thomas Jones, Lewis was drafted in the first round with the fifth overall pick in the 2000 NFL Draft by the Baltimore Ravens. In his rookie season, he rushed for over 1,300 yards, supplanting Priest Holmes as the team's starting running back. On November 19, Lewis became the youngest player since 1960 to record 200 yards from scrimmage (21 years, 82 days). [ citation needed ] The Ravens' running game and punishing defense earned them their first World Championship when they defeated the New York Giants in Super Bowl XXXV. Lewis rushed for 103 yards and scored a touchdown in the game, becoming only the second rookie ever to rush for over 100 yards in a Super Bowl and the youngest player to score a touchdown in a Super Bowl (21). Thomas Q. Jones is an American actor and former American football running back who played twelve seasons in the National Football League (NFL). He played college football for the University of Virginia. He was drafted by the Arizona Cardinals seventh overall in the 2000 NFL Draft, and played for the Tampa Bay Buccaneers in addition to the New York Jets, Chicago Bears and Kansas City Chiefs. He retired among the top 25 leading rushers in NFL history, and a member of the 10,000 yards club. The Baltimore Ravens are a professional American football team based in Baltimore, Maryland. The Ravens compete in the National Football League (NFL) as a member club of the American Football Conference (AFC) North division. The team plays its home games at M&T Bank Stadium and is headquartered in Owings Mills. Lewis missed his sophomore year due to a knee injury he sustained in training camp. Lewis's injury weakened the Ravens running game for much of the season. In the 2003 season, Lewis led the NFL in rushing with 2,066 yards, falling just 40 yards short of officially breaking the all-time single season rushing record, which remains Eric Dickerson's 2,105 record-breaking yards in 1984. Lewis joined Dickerson, Terrell Davis, Barry Sanders, and O. J. Simpson as the only backs in the 2,000 rushing yards club. In 2009, Chris Johnson of the Tennessee Titans, would also surpass the 2,000-yard mark by rushing for 2,006 yards. 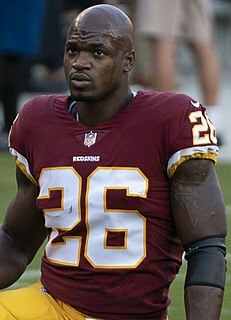 In 2012, Adrian Peterson of the Minnesota Vikings finished with 2,097 rushing yards, the second-most ever for a running back in a single season. On September 14, 2003, Lewis broke Corey Dillon's single-game rushing record of 278 yards by running for 295 yards against the Cleveland Browns. Lewis was rewarded by being named NFL Offensive Player of the Year by the Associated Press. Lewis's single-game rushing record was later broken by Adrian Peterson of the Minnesota Vikings on November 4, 2007, when he ran for 296 yards against the San Diego Chargers. After the 2005 season, the Ravens declined to place the franchise tag on Lewis, making him an unrestricted free agent after the end of the season. This move was seen by many as a formality in letting Lewis move to another team. Popular speculation blamed Lewis' steadily declining performance since the 2003 season. Lewis had also voiced displeasure during the 2005 season over the team's failure to sign him to a long term deal. Despite these events, the Ravens re-signed Lewis on Monday, March 13, 2006 with a three-year deal,  despite having signed former Denver Broncos running back Mike Anderson, who was widely thought to be Lewis' replacement. On November 19, 2006, Lewis rushed for a season-high three touchdowns against the Atlanta Falcons. He ended the season rushing for 1,132 yards and nine touchdowns. On February 28, 2007, the Ravens announced that they released Lewis. However, general manager Ozzie Newsome pointed out that they hoped to re-sign him  but that changed on March 7, 2007, when Lewis signed a contract with the Cleveland Browns. Lewis (#31) lines up to play the San Francisco 49ers in December 2007. 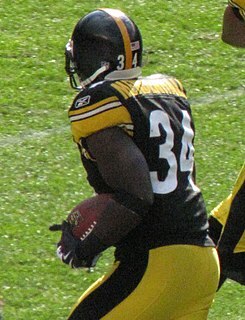 After joining the Browns, Lewis became the team's starting running back. Lewis had his first career 1,300+ yard season since 2003 in his first season with the Browns, rushing for 1,304 yards and nine touchdowns. On November 8, 2008, The Plain Dealer reported that Lewis was dissatisfied with the performance of his teammates in the Browns' recent loss to the Denver Broncos. Lewis stated, "This is the NFL, you can't call it quits until the game is over." Lewis went on to say "it looks to me like some people called it quits before that. Denver was down, but they didn't call it quits. They kept their heads up and they finished. We didn't do that two weeks in a row - at home." Without naming names, Lewis said: "Some people need to check their egos at the door and find some heart to come out here and play hard. This is a man's game. The way we went out there and played two weeks in a row, finishing the same kind of way, it's not there. I think there are some men around here that need to check theirselves, straight up. That's it." On November 2, 2009, Lewis announced he would retire after the 2009 season. Late in the 2009 season, Lewis was placed on injured reserve, ending his season. On February 17, 2010, the Browns released Lewis. Lewis would not sign with another NFL team after his release from the Browns. Corey James Dillon is a former American football running back who played in the National Football League (NFL) for ten seasons, primarily with the Cincinnati Bengals. He was also a member of the New England Patriots. Willis Andrew McGahee III is a former American football running back. He played college football at Miami, where he was recognized as a consensus All-American, and was drafted by the Buffalo Bills in the first round of the 2003 NFL Draft. In addition to his time with the Bills, McGahee played for the Baltimore Ravens, Denver Broncos, and Cleveland Browns. 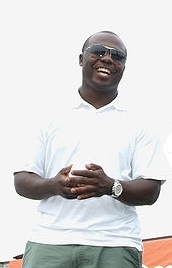 Earnest Alexander Byner is a former American football running back in the National Football League. He is now the running back coach of IMG Academy, a comprehensive football camp that is featured in NFL Undiscovered, a documentary for international prospects. John Matthew "Matt" Stover is a former American Football placekicker. As of the start of the 2009 NFL season, he was the third most accurate kicker in the history of the National Football League. He has played for the New York Giants, Indianapolis Colts, Cleveland Browns, and Baltimore Ravens, with whom he played for 13 seasons. Joseph Kwahu Duah Addai Jr. is a former American football running back in the National Football League (NFL). He was selected in the first round of the 2006 NFL Draft out of Louisiana State University by the Indianapolis Colts and played for the team for six seasons. He won Super Bowl XLI with the Colts, defeating the Chicago Bears. Raymell Mourice Rice is a former American football running back who played his entire professional career with the Baltimore Ravens of the National Football League (NFL). 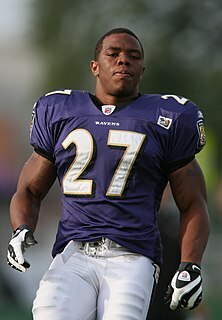 He played college football for Rutgers and was drafted by the Ravens in the second round of the 2008 NFL Draft. He is the Ravens' second all-time leading rusher behind Jamal Lewis, and is also second in rushing attempts and touchdowns, and third in combined touchdowns. He was a member of the 2012 Ravens team that won Super Bowl XLVII over the San Francisco 49ers. The 2000 Baltimore Ravens season was the franchise's fifth season in the National Football League (NFL) and the second under head coach Brian Billick. Rashard Jamal Mendenhall is a former American football running back and current television writer who played in the National Football League (NFL) for six seasons. He played college football at Illinois and was drafted by the Pittsburgh Steelers in the first round of the 2008 NFL Draft. He won Super Bowl XLIII with the Steelers against the Arizona Cardinals, for whom he later played one season. Adrian Lewis Peterson is an American football running back for the Washington Redskins of the National Football League (NFL). He played college football at Oklahoma and was drafted by the Minnesota Vikings seventh overall in the 2007 NFL Draft. Peterson set the NCAA freshman rushing record with 1,925 yards as a true freshman during the 2004 season. As a unanimous first-team All-American, he became the first freshman to finish as the runner-up in the Heisman Trophy balloting. Peterson finished his college football career as the Sooners' third all-time leading rusher. Dion John Lewis is an American football running back for the Tennessee Titans of the National Football League (NFL). He played college football at the University of Pittsburgh and was drafted by the Philadelphia Eagles in the fifth round of the 2011 NFL Draft. With the New England Patriots, he won Super Bowl LI over the Atlanta Falcons in 2017. Lewis was also briefly on the rosters of the Cleveland Browns and Indianapolis Colts, but never appeared in a game situation for either team. Bernard Hayward Pierce is a former American football running back. He played college football for Temple University. He was drafted by the Baltimore Ravens in the third round of the 2012 NFL Draft. Robert James Turbin is an American football running back for the Oakland Raiders of the National Football League (NFL). He played college football for the Utah State Aggies, was drafted in the fourth round of the 2012 NFL Draft by the Seattle Seahawks. With the Seahawks, he won Super Bowl XLVIII over the Denver Broncos. Turbin has also played for the Cleveland Browns, Dallas Cowboys, and Indianapolis Colts. Rex Burkhead is an American football running back for the New England Patriots of the National Football League (NFL). He played college football at Nebraska and was drafted by the Cincinnati Bengals in the sixth round of the 2013 NFL Draft. Because of Burkhead’s versatile skill set that enables him to run the ball, catch passes, block in pass protection, and play special teams, New England Coach Bill Belichick has described him as a rare “four-down player." ↑ Zisner, Lynn. "PRO FOOTBALL; Jamal Lewis Charged in Drug Case", The New York Times , February 26, 2004. "At the time of the alleged crime, Lewis, who had graduated from Douglass High School in Hawaii, was waiting to attend his first N.F.L. training camp." ↑ Rice, Brian. "Tennessee's loss at Florida inside the numbers". Sports Radio WNML. Retrieved July 5, 2017. ↑ "Ravens' Pro Bowl runner Jamal Lewis released". espn.com. February 28, 2007. Retrieved January 27, 2008. ↑ "Lewis expected to turn himself in Thursday". espn.com. February 26, 2004. Retrieved January 27, 2008. ↑ "Regions Bank suing former NFL player over unpaid loan". al.com. November 1, 2011. Retrieved November 1, 2011. ↑ Zamloot, Phil. "Jamal's Employer, Metro Exhibits- Trade show exhibits company". ↑ Rovell, Darren (February 9, 2015). "Jamal Lewis' ring sold in auction". espn.go.com. Retrieved February 9, 2015. ↑ Smith, Michael David (February 9, 2015). "Jamal Lewis sells a Super Bowl ring for $50,820". nbcsports.com. Retrieved February 9, 2015. ↑ Dunne, Tyler (May 29, 2018). "Jamal Lewis Making Most of Post-NFL Life—but Preparing for Darker Days to Come". Bleacher Report. Retrieved June 2, 2018.